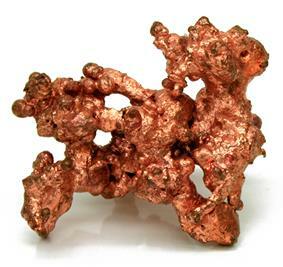 Copper is a chemical element with symbol Cu (from Latin: cuprum) and atomic number 29. 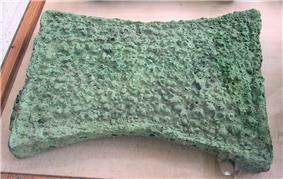 It is a ductile metal with very high thermal and electrical conductivity. Pure copper is soft and malleable; a freshly exposed surface has a reddish-orange color. It is used as a conductor of heat and electricity, a building material, and a constituent of various metal alloys. The metal and its alloys have been used for thousands of years. In the Roman era, copper was principally mined on Cyprus, hence the origin of the name of the metal as aes сyprium (metal of Cyprus), later corrupted to сuprum, from which the words copper (English), cuivre (French), Koper (Dutch) and Kupfer (German) are all derived. Its compounds are commonly encountered as copper(II) salts, which often impart blue or green colors to minerals such as azurite and turquoise and have been widely used historically as pigments. 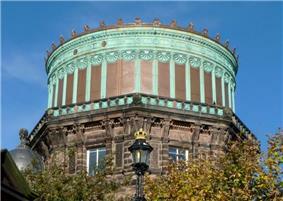 Architectural structures built with copper corrode to give green verdigris (or patina). Decorative art prominently features copper, both by itself and as part of pigments. Copper is essential to all living organisms as a trace dietary mineral because it is a key constituent of the respiratory enzyme complex cytochrome c oxidase. In molluscs and crustacea copper is a constituent of the blood pigment hemocyanin, which is replaced by the iron-complexed hemoglobin in fish and other vertebrates. The main areas where copper is found in humans are liver, muscle and bone. Copper compounds are used as bacteriostatic substances, fungicides, and wood preservatives. A copper disc (99.95% pure) made by continuous casting; etched to reveal crystallites. Copper, silver and gold are in group 11 of the periodic table, and they share certain attributes: they have one s-orbital electron on top of a filled d-electron shell and are characterized by high ductility and electrical conductivity. The filled d-shells in these elements do not contribute much to the interatomic interactions, which are dominated by the s-electrons through metallic bonds. Unlike in metals with incomplete d-shells, metallic bonds in copper are lacking a covalent character and are relatively weak. This explains the low hardness and high ductility of single crystals of copper. At the macroscopic scale, introduction of extended defects to the crystal lattice, such as grain boundaries, hinders flow of the material under applied stress, thereby increasing its hardness. For this reason, copper is usually supplied in a fine-grained polycrystalline form, which has greater strength than monocrystalline forms. The softness of copper partly explains its high electrical conductivity (59.6×106 S/m) and thus also high thermal conductivity, which are the second highest (to silver) among pure metals at room temperature. This is because the resistivity to electron transport in metals at room temperature mostly originates from scattering of electrons on thermal vibrations of the lattice, which are relatively weak for a soft metal. The maximum permissible current density of copper in open air is approximately 3.1×106 A/m2 of cross-sectional area, above which it begins to heat excessively. As with other metals, if copper is placed against another metal, galvanic corrosion will occur. Together with caesium and gold (both yellow), and osmium (bluish), copper is one of only four elemental metals with a natural color other than gray or silver. Pure copper is orange-red and acquires a reddish tarnish when exposed to air. The characteristic color of copper results from the electronic transitions between the filled 3d and half-empty 4s atomic shells – the energy difference between these shells is such that it corresponds to orange light. The same mechanism accounts for the yellow color of gold and caesium. Copper does not react with water but it does slowly react with atmospheric oxygen to form a layer of brown-black copper oxide which, unlike the rust which forms when iron is exposed to moist air, protects the underlying copper from more extensive corrosion. 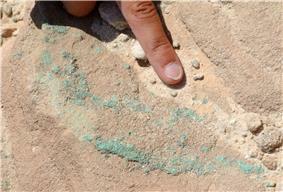 A green layer of verdigris (copper carbonate) can often be seen on old copper constructions such as the Statue of Liberty. Copper tarnishes when exposed to sulfides, which react with it to form various copper sulfides. There are 29 isotopes of copper. 63Cu and 65Cu are stable, with 63Cu comprising approximately 69% of naturally occurring copper; they both have a spin of 3⁄2. The other isotopes are radioactive, with the most stable being 67Cu with a half-life of 61.83 hours. Seven metastable isotopes have been characterized, with 68mCu the longest-lived with a half-life of 3.8 minutes. Isotopes with a mass number above 64 decay by β−, whereas those with a mass number below 64 decay by β+. 64Cu, which has a half-life of 12.7 hours, decays both ways. 62Cu and 64Cu have significant applications. 62Cu is used in 62Cu-PTSM that is a radioactive tracer for positron emission tomography. Copper is synthesized in massive stars and is present in the Earth's crust at a concentration of about 50 parts per million (ppm), where it occurs as native copper or in minerals such as the copper sulfides chalcopyrite and chalcocite, the copper carbonates azurite and malachite, and the copper(I) oxide mineral cuprite. The largest mass of elemental copper discovered weighed 420 tonnes and was found in 1857 on the Keweenaw Peninsula in Michigan, US. 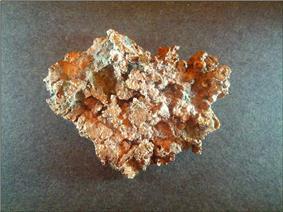 Native copper is a polycrystal, with the largest described single crystal measuring 4.4×3.2×3.2 cm. Most copper is mined or extracted as copper sulfides from large open pit mines in porphyry copper deposits that contain 0.4 to 1.0% copper. Examples include Chuquicamata in Chile, Bingham Canyon Mine in Utah, United States and El Chino Mine in New Mexico, United States. According to the British Geological Survey, in 2005, Chile was the top mine producer of copper with at least one-third world share followed by the United States, Indonesia and Peru. Copper can also be recovered through the in-situ leach process. Several sites in the state of Arizona are considered prime candidates for this method. The amount of copper in use is increasing and the quantity available is barely sufficient to allow all countries to reach developed world levels of usage. Copper has been in use at least 10,000 years, but more than 95% of all copper ever mined and smelted has been extracted since 1900, and more than half was extracted in only the last 24 years. As with many natural resources, the total amount of copper on Earth is vast (around 1014 tons just in the top kilometer of Earth's crust, or about 5 million years' worth at the current rate of extraction). However, only a tiny fraction of these reserves is economically viable, given present-day prices and technologies. Various estimates of existing copper reserves available for mining vary from 25 years to 60 years, depending on core assumptions such as the growth rate. Recycling is a major source of copper in the modern world. Because of these and other factors, the future of copper production and supply is the subject of much debate, including the concept of peak copper, analogous to peak oil. The price of copper has historically been unstable, and it sextupled from the 60-year low of US$0.60/lb (US$1.32/kg) in June 1999 to US$3.75 per pound (US$8.27/kg) in May 2006. It dropped to US$2.40/lb (US$5.29/kg) in February 2007, then rebounded to US$3.50/lb (US$7.71/kg) in April 2007. In February 2009, weakening global demand and a steep fall in commodity prices since the previous year's highs left copper prices at US$1.51/lb. Like aluminium, copper is 100% recyclable without any loss of quality, regardless of whether it is in a raw state or contained in a manufactured product. In volume, copper is the third most recycled metal after iron and aluminium. 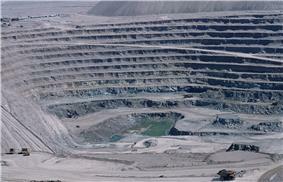 It is estimated that 80% of the copper ever mined is still in use today. According to the International Resource Panel's Metal Stocks in Society report, the global per capita stock of copper in use in society is 35–55 kg. Much of this is in more-developed countries (140–300 kg per capita) rather than less-developed countries (30–40 kg per capita). 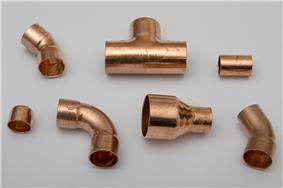 Numerous copper alloys exist, many with important uses. Brass is an alloy of copper and zinc. Bronze usually refers to copper-tin alloys, but can refer to any alloy of copper such as aluminium bronze. Copper is one of the most important constituents of carat silver and gold alloys, and carat solders are used in the jewelry industry, modifying the color, hardness and melting point of the resulting alloys. The alloy of copper and nickel, called cupronickel, is used in low-denomination coins, often for the outer cladding. The US 5-cent coin called a nickel consists of 75% copper and 25% nickel and has a homogeneous composition. The alloy consisting of 90% copper and 10% nickel is remarkable for its resistance to corrosion and is used in various parts that are exposed to seawater. Alloys of copper with aluminium (about 7%) have a pleasant golden color and are used in decorations. Some lead-free solders consist of tin alloyed with a small proportion of copper and other metals. As with other elements, the simplest compounds of copper are binary compounds, i.e. those containing only two elements. The principal ones are the oxides, sulfides, and halides. Both cuprous and cupric oxides are known. Among the numerous copper sulfides, important examples include copper(I) sulfide and copper(II) sulfide. The cuprous halides with chlorine, bromine, and iodine are known, as are the cupric halides with fluorine, chlorine, and bromine. Attempts to prepare copper(II) iodide give cuprous iodide and iodine. Many other oxyanions form complexes; these include copper(II) acetate, copper(II) nitrate, and copper(II) carbonate. 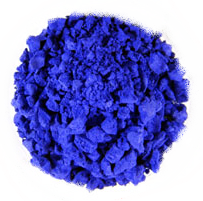 Copper(II) sulfate forms a blue crystalline pentahydrate, which is the most familiar copper compound in the laboratory. It is used in a fungicide called the Bordeaux mixture. Compounds that contain a carbon-copper bond are known as organocopper compounds. They are very reactive towards oxygen to form copper(I) oxide and have alkenes and carbon monoxide, especially in the presence of amine ligands. 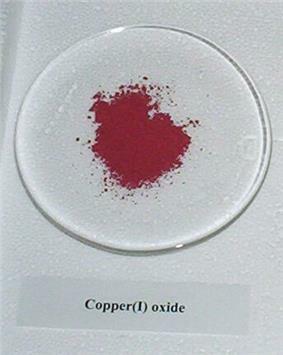 Copper(III) is most characteristically found in oxides. A simple example is potassium cuprate, KCuO2, a blue-black solid. 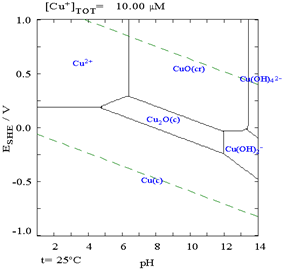 The best studied copper(III) compounds are the cuprate superconductors. Yttrium barium copper oxide (YBa2Cu3O7) consists of both Cu(II) and Cu(III) centres. 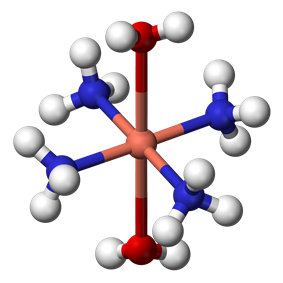 Like oxide, fluoride is a highly basic anion and is known to stabilize metal ions in high oxidation states. 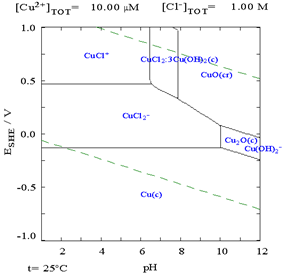 Indeed, both copper(III) and even copper(IV) fluorides are known, K3CuF6 and Cs2CuF6, respectively. 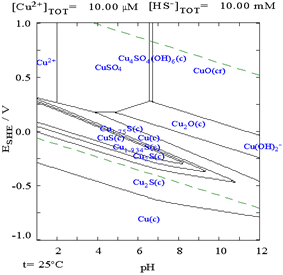 Complexes of copper(III) are also observed as intermediates in reactions of organocopper compounds. Copper occurs naturally as native copper and was known to some of the oldest civilizations on record. It has a history of use that is at least 10,000 years old, and estimates of its discovery place it at 9000 BC in the Middle East; a copper pendant was found in northern Iraq that dates to 8700 BC. There is evidence that gold and meteoric iron (but not iron smelting) were the only metals used by humans before copper. The history of copper metallurgy is thought to have followed the following sequence: 1) cold working of native copper, 2) annealing, 3) smelting, and 4) the lost wax method. In southeastern Anatolia, all four of these metallurgical techniques appears more or less simultaneously at the beginning of the Neolithic c. 7500 BC. However, just as agriculture was independently invented in several parts of the world, copper smelting was invented locally in several different places. It was probably discovered independently in China before 2800 BC, in Central America perhaps around 600 AD, and in West Africa about the 9th or 10th century AD. Investment casting was invented in 4500–4000 BC in Southeast Asia and carbon dating has established mining at Alderley Edge in Cheshire, UK at 2280 to 1890 BC. 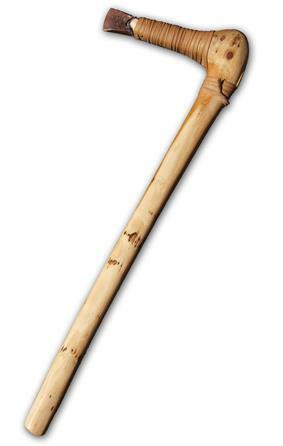 Ötzi the Iceman, a male dated from 3300–3200 BC, was found with an axe with a copper head 99.7% pure; high levels of arsenic in his hair suggest his involvement in copper smelting. Experience with copper has assisted the development of other metals; in particular, copper smelting led to the discovery of iron smelting. Production in the Old Copper Complex in Michigan and Wisconsin is dated between 6000 and 3000 BC. Natural bronze, a type of copper made from ores rich in silicon, arsenic, and (rarely) tin, came into general use in the Balkans around 5500 BC. Alloying copper with tin to make bronze was first practiced about 4000 years after the discovery of copper smelting, and about 2000 years after "natural bronze" had come into general use. Bronze artifacts from the Vinča culture date to 4500 BC. Sumerian and Egyptian artifacts of copper and bronze alloys date to 3000 BC. The Bronze Age began in Southeastern Europe around 3700–3300 BC, in Northwestern Europe about 2500 BC. It ended with the beginning of the Iron Age, 2000–1000 BC in the Near East, 600 BC in Northern Europe. The transition between the Neolithic period and the Bronze Age was formerly termed the Chalcolithic period (copper-stone), with copper tools being used with stone tools. This term has gradually fallen out of favor because in some parts of the world the Chalcolithic and Neolithic are coterminous at both ends. Brass, an alloy of copper and zinc, is of much more recent origin. 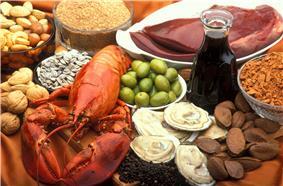 It was known to the Greeks, but became a significant supplement to bronze during the Roman Empire. 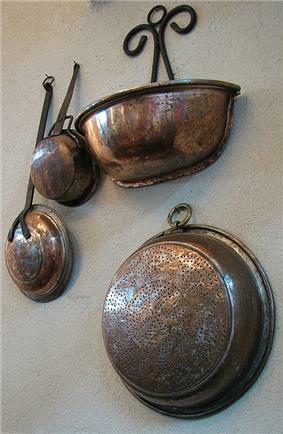 In Greece, copper was known by the name chalkos (χαλκός). It was an important resource for the Romans, Greeks and other ancient peoples. In Roman times, it was known as aes Cyprium, aes being the generic Latin term for copper alloys and Cyprium from Cyprus, where much copper was mined. The phrase was simplified to cuprum, hence the English copper. Aphrodite and Venus represented copper in mythology and alchemy, because of its lustrous beauty, its ancient use in producing mirrors, and its association with Cyprus, which was sacred to the goddess. The seven heavenly bodies known to the ancients were associated with the seven metals known in antiquity, and Venus was assigned to copper. Britain's first use of brass occurred around the 3rd–2nd century BC. In North America, copper mining began with marginal workings by Native Americans. Native copper is known to have been extracted from sites on Isle Royale with primitive stone tools between 800 and 1600. Copper metallurgy was flourishing in South America, particularly in Peru around 1000 AD; it proceeded at a much slower rate on other continents. Copper burial ornamentals from the 15th century have been uncovered, but the metal's commercial production did not start until the early 20th century. The gates of the Temple of Jerusalem used Corinthian bronze made by depletion gilding. It was most prevalent in Alexandria, where alchemy is thought to have begun. In ancient India, copper was used in the holistic medical science Ayurveda for surgical instruments and other medical equipment. Ancient Egyptians (~2400 BC) used copper for sterilizing wounds and drinking water, and later on for headaches, burns, and itching. The Baghdad Battery, with copper cylinders soldered to lead, dates back to 248 BC to AD 226 and resembles a galvanic cell, leading people to believe this was the first battery; the claim has not been verified. The Great Copper Mountain was a mine in Falun, Sweden, that operated from the 10th century to 1992. It produced two thirds of Europe's copper demand in the 17th century and helped fund many of Sweden's wars during that time. It was referred to as the nation's treasury; Sweden had a copper backed currency. The uses of copper in art were not limited to currency: it was used by Renaissance sculptors, in photographic technology known as the daguerreotype, and the Statue of Liberty. Copper plating and copper sheathing for ships' hulls was widespread; the ships of Christopher Columbus were among the earliest to have this feature. The Norddeutsche Affinerie in Hamburg was the first modern electroplating plant starting its production in 1876. The German scientist Gottfried Osann invented powder metallurgy in 1830 while determining the metal's atomic mass; around then it was discovered that the amount and type of alloying element (e.g., tin) to copper would affect bell tones. Flash smelting was developed by Outokumpu in Finland and first applied at Harjavalta in 1949; the energy-efficient process accounts for 50% of the world's primary copper production. The Intergovernmental Council of Copper Exporting Countries, formed in 1967 with Chile, Peru, Zaire and Zambia, played a similar role for copper as OPEC does for oil. It never achieved the same influence, particularly because the second-largest producer, the United States, was never a member; it was dissolved in 1988. The major applications of copper are in electrical wires (60%), roofing and plumbing (20%) and industrial machinery (15%). Copper is mostly used as a pure metal, but when a higher hardness is required it is combined with other elements to make an alloy (5% of total use) such as brass and bronze. A small part of copper supply is used in production of compounds for nutritional supplements and fungicides in agriculture. Machining of copper is possible, although it is usually necessary to use an alloy for intricate parts to get good machinability characteristics. Integrated circuits and printed circuit boards increasingly feature copper in place of aluminium because of its superior electrical conductivity (see Copper interconnect for main article); heat sinks and heat exchangers use copper as a result of its superior heat dissipation capacity to aluminium. Electromagnets, vacuum tubes, cathode ray tubes, and magnetrons in microwave ovens use copper, as do wave guides for microwave radiation. Copper's greater conductivity versus other metals enhances the electrical energy efficiency of motors. This is important because motors and motor-driven systems account for 43%-46% of all global electricity consumption and 69% of all electricity used by industry. 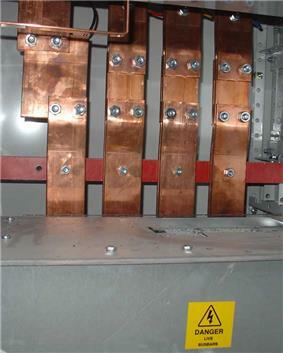 Increasing the mass and cross section of copper in a coil increases the electrical energy efficiency of the motor. Copper motor rotors, a new technology designed for motor applications where energy savings are prime design objectives, are enabling general-purpose induction motors to meet and exceed National Electrical Manufacturers Association (NEMA) premium efficiency standards. The metal's distinctive natural green patina has long been coveted by architects and designers. The final patina is a particularly durable layer that is highly resistant to atmospheric corrosion, thereby protecting the underlying metal against further weathering. It can be a mixture of carbonate and sulfate compounds in various amounts, depending upon environmental conditions such as sulfur-containing acid rain. 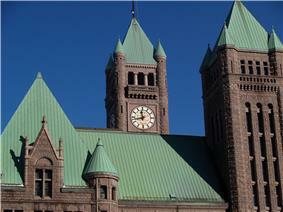 Architectural copper and its alloys can also be 'finished' to embark a particular look, feel, and/or color. Finishes include mechanical surface treatments, chemical coloring, and coatings. Copper is biostatic, meaning bacteria will not grow on it. For this reason it has long been used to line parts of ships to protect against barnacles and mussels. It was originally used pure, but has since been superseded by Muntz metal. Similarly, as discussed in copper alloys in aquaculture, copper alloys have become important netting materials in the aquaculture industry because they are antimicrobial and prevent biofouling, even in extreme conditions and have strong structural and corrosion-resistant properties in marine environments. E. coli O157:H7, methicillin-resistant Staphylococcus aureus (MRSA), Staphylococcus, Clostridium difficile, influenza A virus, adenovirus, and fungi). Some 355 copper alloys were proven to kill more than 99.9% of disease-causing bacteria within just two hours when cleaned regularly. The United States Environmental Protection Agency (EPA) has approved the registrations of these copper alloys as "antimicrobial materials with public health benefits," which allows manufacturers to legally make claims as to the positive public health benefits of products made with registered antimicrobial copper alloys. In addition, the EPA has approved a long list of antimicrobial copper products made from these alloys, such as bedrails, handrails, over-bed tables, sinks, faucets, door knobs, toilet hardware, computer keyboards, health club equipment, shopping cart handles, etc. (for a comprehensive list of products, see: Antimicrobial copper-alloy touch surfaces#Approved products). Copper doorknobs are used by hospitals to reduce the transfer of disease, and Legionnaires' disease is suppressed by copper tubing in plumbing systems. Antimicrobial copper alloy products are now being installed in healthcare facilities in the U.K., Ireland, Japan, Korea, France, Denmark, and Brazil and in the subway transit system in Santiago, Chile, where copper-zinc alloy handrails will be installed in some 30 stations between 2011–2014. Copper is commonly used in jewelry, and folklore says that copper bracelets relieve arthritis symptoms. In alternative medicine, some proponents speculate that excess copper absorbed through the skin can treat some ailments, or that the copper somehow creates a magnetic field, treating nearby tissue. There is no evidence that copper even can be absorbed through the skin. But if it were, this could actually lead to copper poisoning, which may actually be more likely than beneficial effects. More recently, some compression clothing has been sold with copper woven into it, with the same folk medicine claims being made. While compression clothing is a real treatment for some ailments, therefore the clothing may appear to work, the added copper may very well have no benefit beyond a placebo effect. 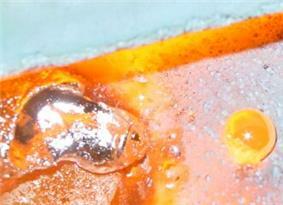 Copper is used as the printing plate in etching, engraving and other forms of intaglio (printmaking) printmaking. Copper oxide and carbonate is used in glassmaking and in ceramic glazes to impart green and brown colors. Copper is the principal alloying metal in some sterling silver and gold alloys. It may also be used on its own, or as a constituent of brass, bronze, gilding metal and many other base metal alloys. Chromobacterium violaceum and Pseudomonas fluorescens can both mobilize solid copper, as a cyanide compound. The Ericoid Mycorrhizal Fungi Calluna, Erica and Vaccinium can grow in copper metalliferous soils. The ectomycorrhizal fungi Suillus luteus protects young pine trees from copper toxicity. 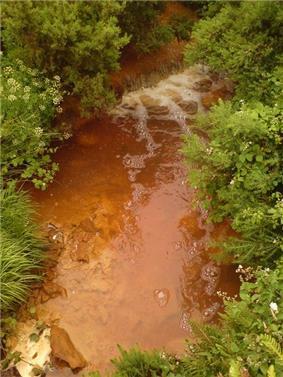 A sample of the fungus Aspergillus niger was found growing from gold mining solution; and was found to contain cyano metal complexes; such as gold, silver, copper iron and zinc. The fungus also plays a role in the solubilization of heavy metal sulfides. hemoglobin for this purpose. Structurally related to hemocyanin are the laccases and tyrosinases. Instead of reversibly binding oxygen, these proteins hydroxylate substrates, illustrated by their role in the formation of lacquers. 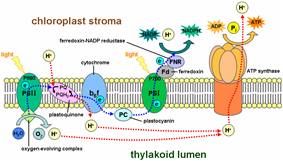 Photosynthesis functions by an elaborate electron transport chain within the thylakoid membrane. A central "link" in this chain is plastocyanin, a blue copper protein. Copper is an essential  Stated differently, the RDA for copper in normal healthy adults is quoted as 0.97 mg/day and as 3.0 mg/day. Copper is absorbed in the gut, then transported to the liver bound to albumin. After processing in the liver, copper is distributed to other tissues in a second phase. Copper transport here involves the protein ceruloplasmin, which carries the majority of copper in blood. Ceruloplasmin also carries copper that is excreted in milk, and is particularly well-absorbed as a copper source. Copper in the body normally undergoes enterohepatic circulation (about 5 mg a day, vs. about 1 mg per day absorbed in the diet and excreted from the body), and the body is able to excrete some excess copper, if needed, via bile, which carries some copper out of the liver that is not then reabsorbed by the intestine. ^ Copper.org"Overview of Recycled Copper" . Copper.org (25 August 2010). Retrieved on 8 November 2011. ^ Balver Zinn Solder Sn97Cu3. (PDF) . balverzinn.com. Retrieved on 8 November 2011. ^ No primary source is given in that book. ^ Joseph, Günter, 1999, Copper: Its Trade, Manufacture, Use, and Environmental Status, edited by Kundig, Konrad J.A., ASM International, pps. 141–192 and pps. 331–375. ^ Fuchsloch, J. and E.F. Brush, (2007), "Systematic Design Approach for a New Series of Ultra‐NEMA Premium Copper Rotor Motors", in EEMODS 2007 Conference Proceedings, 10‐15 June,Beijing. ^ Edding, Mario E., Flores, Hector, and Miranda, Claudio, (1995), Experimental Usage of Copper-Nickel Alloy Mesh in Mariculture. 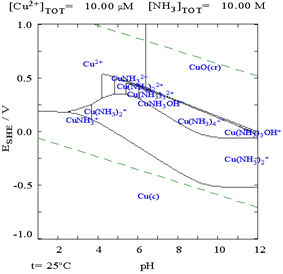 Part 1: Feasibility of usage in a temperate zone; Part 2: Demonstration of usage in a cold zone; Final report to the International Copper Association Ltd.
^ Corrosion Behaviour of Copper Alloys used in Marine Aquaculture. (PDF) . copper.org. Retrieved on 8 November 2011. ^ a b Copper Touch Surfaces. Copper Touch Surfaces. Retrieved on 8 November 2011. ^ Chilean subway protected with Antimicrobial Copper – Rail News from. rail.co. Retrieved on 8 November 2011. ^ Codelco to provide antimicrobial copper for new metro lines (Chile). Construpages.com.ve. Retrieved on 8 November 2011. ^ PR 811 Chilean Subway Installs Antimicrobial Copper. (PDF). antimicrobialcopper.com. Retrieved on 8 November 2011. No difference was observed between devices in terms of their effects on pain as measured by the primary outcome measure (WOMAC A), the PRI and the VAS. Similar results were obtained for stiffness (WOMAC B), physical function (WOMAC C), and medication use. Further analyses of the PRI subscales revealed a statistically significant difference between devices (P=0.025), which favoured the experimental device. Participants reported lower sensory pain after wearing the standard magnetic wrist strap, than when wearing control devices. However, no adjustment was made for multiple testing. Can wearing a copper bracelet cure arthritis? According to the Center for Hand and Upper Extremity Surgery at UAMS, copper deficiency is extremely rare and most regular diets provide enough copper to meet the daily requirements. Copper is a component of some of the normal cellular enzymes in most mineral rich foods, such as vegetables, potatoes, legumes (beans and peas), nuts (peanuts and pecans), grains (wheat and rye) and fruits. Supplementation is only needed in patients with serious medical conditions that affect their gastrointestinal tract and impair their ability to absorb nutrients. So it seems possible that copper-infused compression clothing could help you recover from a tough workout, and it's also possible it could have some anti-bacterial properties in clothes. But as for the claims in the infomercial about relieving joint pain and helping with everyday aches — any relief from copper-compression seems more likely to be a placebo effect than anything else. Think carefully before shelling out for Tommie Copper. ^ a b c S. J. Lippard, J. M. Berg "Principles of bioinorganic chemistry" University Science Books: Mill Valley, CA; 1994. ISBN 0-935702-73-3. ^ Brewer GJ. Copper excess, zinc deficiency, and cognition loss in Alzheimer's disease. BioFactors (Oxford, England). March 2012;38(2):107–113. doi:10.1002/biof.1005. PMID 22438177.